Heat oven to 375°F. Spray medium nonstick skillet with nonstick cooking spray. Chop or shred chicken. 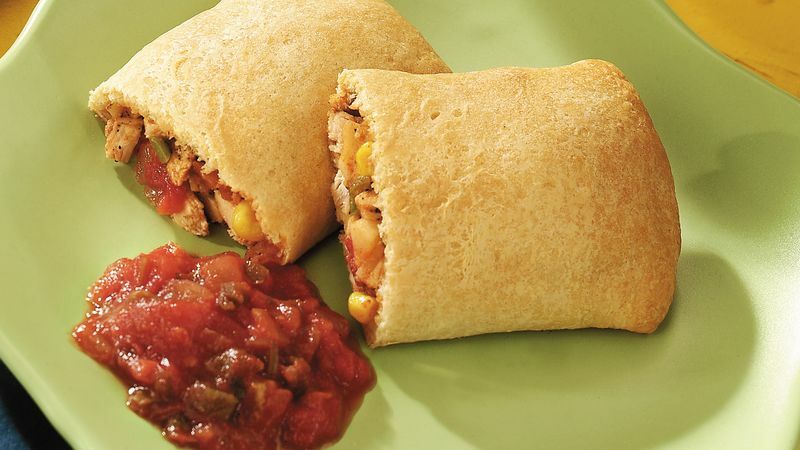 In sprayed skillet, combine chicken, potatoes, corn and salsa; mix well. Cook over medium heat for 5 to 6 minutes or until corn is crisp-tender, stirring frequently. Cool slightly. Separate dough into 8 rectangles. Press perforations to seal. Press or roll each to form 6x4-inch rectangle. Spoon about 1/2 cup chicken mixture lengthwise down center third of each rectangle. Fold long sides of each rectangle over filling to meet in center; pinch to seal center and ends. Place seam side down on ungreased cookie sheet. Bake at 375°F. for 10 to 15 minutes or until golden brown. If desired, serve with additional salsa.